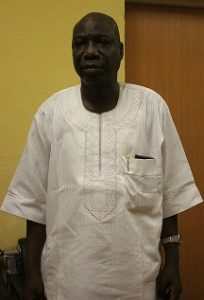 Mr. Hakeem Babatunde Sarumi was born in Lagos on October 26th 1960 at Ita Agarawu/Idumagbo area of Lagos Island. He attended Ansar-u-deen Grammar School, Surulere where he obtained the West African School Certificate and preceded to Anwar-ul-Islam College, Agege for his A levels. He graduated from the University of Lagos in 1983 with a Bachelors of Arts Degree in Philosophy. He is a Barrister at Law having obtained LLB from the Lagos State University in 1999. He was called to Bar in January 2001. Mr. Sarumi capped his academic journey with a Master of Public Administration (MPA) from the National Open University of Nigeria (NOUN). He joined the Lagos State Public Service as an Information Officer 11 GL 08 in 1987 and later converted to Admin Officer 1 GL 09. He served in various ministries and was appointed Director, Lagos State Traffic Management Authority, Civil Service Commission, as a Director, Recruitment and Appeals, Civil Service Pension Office, Administration and Human Resources and presently serves as Director Admin. and Human Resources, Ministry of Tourism, Arts and Culture.